Otis 3" Cleaning Patches All Calibers For .25 to 12/10 GA - Hunting and Outdoor Supplies. Otis Technology Cleaning Patches are 100% cotton and each high quality patch can be used up to 6 times, offering 6 new clean surfaces. When attached to the slotted tip, they form a perfectly circular cleaning swab to allow for 360 degree coverage! The same patches used in the Otis cleaning system kits. Pre-slotted to fit loop-style rod tip. Each patch can be varied in size by pinching at the various slots. The unique design of Otis 3" Cleaning Patches provides maintenance and upkeep of a multitude of firearms. The all-caliber cleaning patches are unique in that one patch cleans all firearms from .25 to .50 caliber for rifles and pistols and .410 to 12/10 gauge for shotgun. Size: 3". Otis Technology All-Caliber Cleaning Patches are an excellent cleaning accessory that work equally well with virtually any size weapon. Most patches are designed to fit only a certain caliber of rifle, shotgun, or handgun, but Otis Technology has developed a patch that fits all calibers and gauges. Every firearm ranging from .22 caliber rifles to 10 gauge shotguns can be cleaned using this Otis Technology cleaning kit. Otis All Caliber Patches can be used up to six times and are 100% cotton, making them highly absorbent with all sorts of solvents and lubricants. These unique cleaning kits offer 360 degrees of cleaning coverage and can be attached to any cleaning rod with a slotted tip. Depending on your needs, you can purchase these universal patches in this 100 count pack. 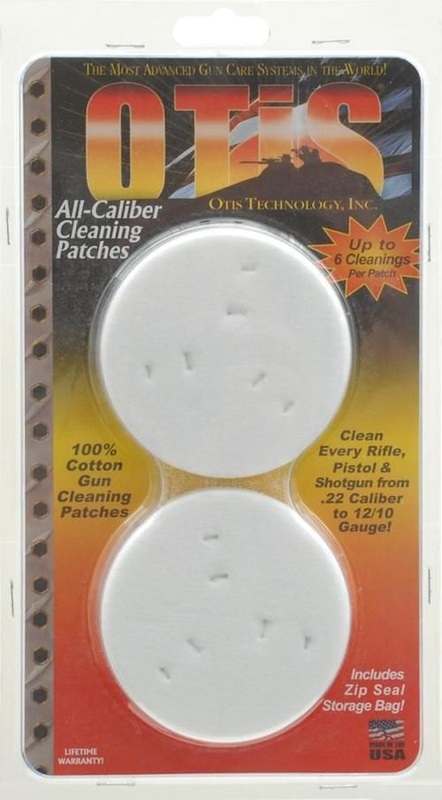 Otis Technology All-Caliber Patches are the universal cleaning patches that don't have to be cut down or measured for size, whether you're cleaning a 10 gauge shotgun or a .357 magnum handgun. The Otis Technology Breech-to-Muzzle® Cleaning System is widely regarded by experts as the most advanced gun cleaning system in the world. It offers many gun cleaning advancements and refinements developed for the military and competitive marksmen and hunters. By cleaning Breech-to-Muzzle® (the direction the bullet moves through the firearm), dirt and fouling is pulled out the muzzle, not pushed back into the action gumming the trigger or causing malfunctions. Because the slotted tip with the patch is pulled through the chamber, it doesn't compress the patch against the side of the rod. Conventional rods will jam off-center, scraping the rifling in the process, and potentially ruining the bore. The Otis Memory-Flex® rod allows you to tightly form the patch to the bore, actually cleaning it rather than just moving the dirt around. The tight patch is formed by being pulled through the chamber, compressing in the throat, and cleans the leading edge of the rifling; the edge that actually bears the stress of the rotating bullet. 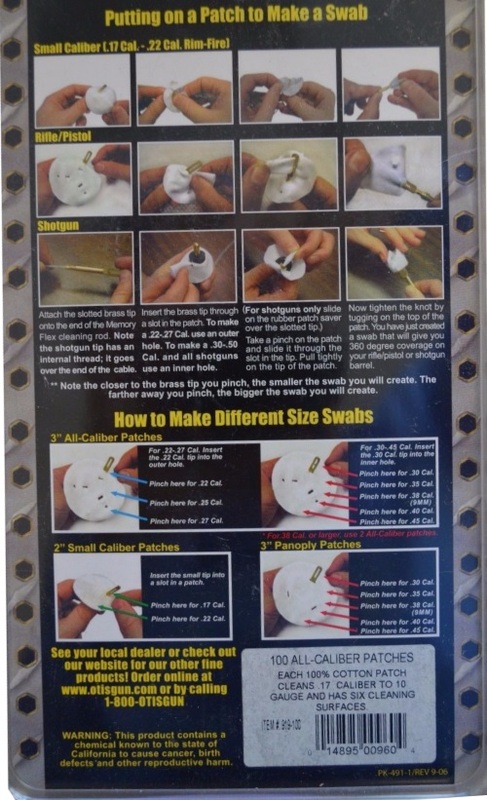 For shotguns, custom soft durometer plugs, (patch savers®) force the patch to the full diameter of the bore, cleaning the chamber, forcing cone, bore and choke -- all without having to disassemble the gun! * All of Otis' products and components are manufactured and assembled in a state-of-the-art manufacturing facility in Lyons Falls and Phoenix, New York. * All products are MADE IN THE USA! * All non-consumable parts come with a limited lifetime warranty. * Otis strives to introduce the newest and most advanced technologies to the gun cleaning market. * Many of Otis's military parts have a NSN (National Stock Number) so that the military can easily order. * Otis are a family owned and operated company. * Otis products are designed to be the best and are manufactured in the USA with high-quality materials to the highest industry standards.